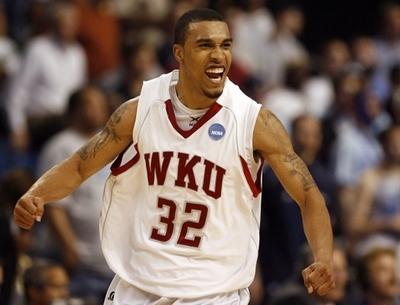 Courtney Lee is coming to Boston. In a sign-and-trade deal that was reported yesterday and finalized today, the Boston Celtics acquire the 26-year old shooting guard from the Houston Rockets in return for JaJuan Johnson, E’Twaun Moore, Sean Williams, and a second round pick. Also as part of the deal, Sasha Pavlovic, and two additional Celtics second round picks will be headed to Portland, with former Ohio State guard Jon Diebler moving to Houston as part of the three team deal. The Rockets reportedly will release E’Twaun Moore shortly, and it is expected that he will end up in a Chicago Bulls’ uniform, which is the part of the deal that I dislike the most. With Ray Allen joining basketball’s version of the Evil Empire, the Celtics needed to sign acquire one more backcourt player for the upcoming season, especially as Avery Bradley recovers from two off-season shoulder surgeries. With O.J. Mayo and several other candidates wanting salaries too rich for the Celtics blood, Danny Ainge and his staff decided to pull the trigger on a move that now brings Courtney Lee to Causeway Street and sends the franchise’s entire 2011 draft (two former Purdue University standouts) into the central time-zone. Courtney Lee is more than a solid player and he is a great fit for this particular Celtics team. When I found out about the move last night I was upset as Moore has really come into his own during this year’s summer league (yes, summer league games encouraged me about his play) and JaJuan Johnson and Sean Williams can both provide solid defense from the center position coming off the bench. When I heard that three second round picks were also being shipped out of Boston in this trade I started to like it even less, but now thinking about it more objectively I realize how easy it is to buy those second round picks, as shown by Brooklyn Nets owner Mikhail Prokhorov’s manhandling of recent drafts. So, in essence, the C’s traded away a couple young players that may or may not eventually pan out along with a few easily purchasable second round picks in order to acquire a player who is an above average swingman defender, and a player who has proven that he can knock down the open shot when called upon. Lee will never be the team’s first, second, or maybe even third option offensively but he did rank second in the NBA in corner three shooting percentage last season (trailing only Ray Allen) and according to Synergy Sports Technology, Lee converted 42.9 percent of his spot up three point attempts last season. Remind you of anyone, Boston fans? Mr. Lee is a great complement to this currently assembled Celtics team no matter what role he fills. I’d feel better about this trade if I knew exactly what that role is, but my guess is that Lee will fill in as the starting two-guard while Avery Bradley heals back to full strength (since Jason Terry has perfected the 6th man role). When Bradley is back, my guess is that the now third year player out Texas will assume the starting role he had towards the end of last season and will team up with Rondo to form one of the best young backcourts in the National Basketball Association. That would leave Terry as his primary backup and move Courtney Lee down to third on the depth chart at the off-guard position, but it is not inconceivable that they could all be on the court at the same time with some rotations. There are plenty of minutes to go around, especially since the trio will also act as Rondo’s backup at the point-guard position (with Paul Pierce becoming the primary ball-handler in those situations) so all three of these guys should feel pretty happy about their place on the roster and their role with the team. The 2012-2013 Celtics will need everyone to chip in, and with aging veterans will be forced to run a deeper rotation than they have in years past. It is always a luxury to have the kind of depth that Courtney Lee can provide at multiple positions. Throughout his career Lee has averaged 10 points, about 3 rebounds, and at least 1 assist and 1 steal per game (in just over 27 minutes per game during his 4 years in the NBA). Depending on how much playing time he gets for Doc Rivers and the Celtics, I would expect much of the same production from him as his role will be very similar to what he’s had with the Magic, Nets, and Rockets over his brief career, with the only difference being the talent level of his teammates with the Celtics being much higher than anything he’s had since his rookie year with the Magic when they went to the NBA Finals. 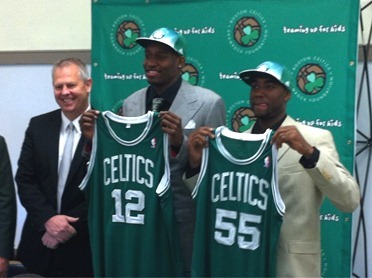 If that’s what the Celtics get from him, then Danny Ainge will have to be ecstatic with this move. Welcome to Boston, Mr. Lee. This entry was posted in NBA and tagged Basketball, Boston, Boston Celtics, Celtics, Courtney Lee, NBA, Portland, Rockets, Sports. Bookmark the permalink.